It’s a little early for gifts, but with Christmas approaching we have something special going on in Waterstones on Friday, 4th December. The North West Literary Salon is proud to present two esteemed writers for our latest event with readings, refreshments, music and conversation. Born in Manchester, Alison Moore is a novelist and short-fiction writer. Her first novel, The Lighthouse , was shortlisted for the Man Booker Prize and the National Book Awards in 2012 – she went on to win the McKitterick Prize in 2013. Her second novel, He Wants, was published last year and one of her short stories, Ausland, is being included in an anthology called Dead Letters, edited by Conrad Williams – forthcoming in 2016. If you want to read more, check out her website. Formerly a freelance fiction writer, Graham Mort is now professor of Creative Writing and Transcultural Literature at Lancaster University. Primarily, he is a poet and short-fiction writer. His recent academic research in African writer-development programs such as Crossing Borders (2001-2006) and Radiophonics (2006-2009) has taken him to places such as Uganda, Malawi, Kenya and Zimbabwe. Currently, he is working on a new collection of poems called Black Shiver Moss. You can find out more about him here. Why not ease yourself into the festive season with some literary entertainment and linguistic magic? Order your free tickets here . We hope you can make it! 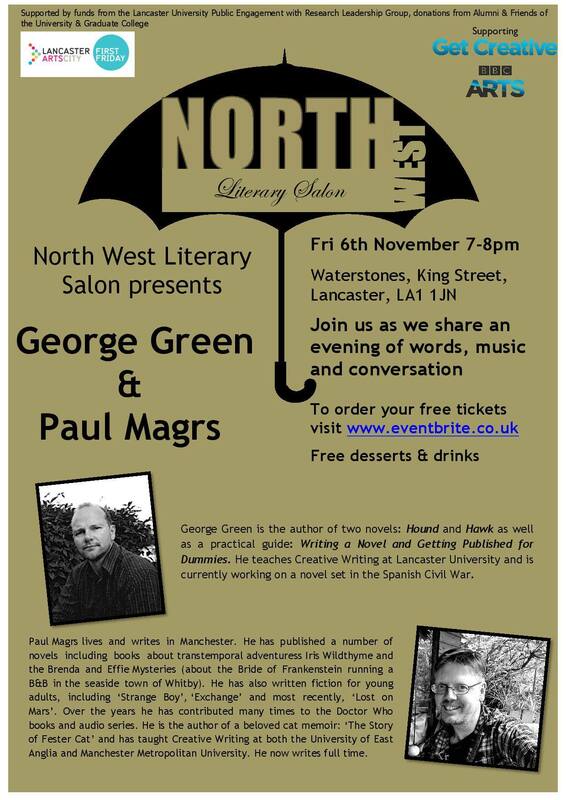 On November 6th Lancaster was lit up with fireworks, light installations and vivid, imaginative readings by Paul Magrs and George Green at North West Literary Salon. Paul read from his new novel Lost on Mars and George read a sneak preview from his upcoming novel, which is set during the Spanish Civil War. Paul is a Doctor Who fan and lover of Science Fiction. As he reads, he conveys a sense of meandering joy. There’s a talking tanning bed and a Nan with a robotic leg. It’s a book full of ideas and possibilities, where the past hurtles into the future. Little House on the Prairie set amongst the corroding dust of the red planet. As he reads he occasionally looks up, as if to visualize the story in his head. In the audience we sense it coming through: warmth, hope and the quiet excitement of a well-told story. At a certain point in his life, George Green realised that he could not be both a pool guard and a Creative Writing Workshop tutor. ‘I was in sport and leisure. I did that for 15 years,’ he says over coffee. This is our second attempt to meet up. There are two pubs in Lancaster with the word ‘Witch’ in the title. I went to The Pendle Witch and George went to The Water Witch. Not the best of starts. In the end we settle for a café. I ask him if he hangs out with other writers, who smoke black cigarettes and drink black coffee – that type of crowd. He blinks and says, No. When did I know?’ He laughs. Like, really laughs. I guess that’s all the answer I’m going to get. With interests that spread from mythology to the Western, I ask George why he would decide to set a novel during the Spanish Civil War. I say that there’s probably a geographical factor in that. ‘There probably is,’ he replies, ‘America’s such a large country and it’s like their minds project outwards, you know, the great American novel. Whereas we look inwards – stuff like Jane Austen. We complain that they’re optimistic and they complain that we’re pessimistic. And we’re both right.’ He laughs. We talk about Larry Heinemann, who wrote Paco’s Story, an excellent Vietnam War novel that George likes. Then we talk about Cuba. I went to Cuba a while ago. He laughs at this. He says that a friend of his went to Cuba expecting sunny beaches. But she ended up feeling the same way I did – like there was something dark under the surface. He tells me his friend became acquainted with the woman at the hotel desk. The woman asked her if she had any makeup. Being an obliging soul, she put all of her makeup in a bag and gave it to her as a present. The woman was so happy she cried. Before I know it we run out of time. ‘Is that enough?’ he asks. So we walk that way and up through a poster sale – pictures of Jimi Hendrix and The La’s and The Arctic Monkeys, men with moneyboxes and students with no money. No coffee to drink. We say goodbye and he walks away in to the rain. This Friday we’ll be returning to Waterstones for another Literary Salon. This time, writers George Green and Paul Magrs will take the stage. Along with them, Joe Gardiner will set the mood by performing with his guitar. Also, Yvonne Battle-Felton and Naomi Kruger will host the event and provide drinks and desserts after the reading. George Green is a novelist and a Senior Lecturer at Lancaster University. He has also written books on writing itself such as Writing a Novel and Getting Published for Dummies. He is interested in Irish Literature and Myth and is currently writing a novel set during the Spanish Civil War. Paul Magrs is a full-time writer who has published novels such as Could it be Magic? and Marked for Life. He’s also made an admirable contribution to the Doctor Who universe, having written several audio plays for Big Finish Productions, a series of Doctor Who novels and my personal favourite, The Diary of a Dr. Who Addict. Our candles will also be lit for the Light-Up Lancaster event, so keep in mind that there will be plenty going on afterwards in town. Do come along this Friday to hear these gentlemen read their work and in one case, play their guitar. If you’re looking for tickets, you can get them here. We hope you can make it!